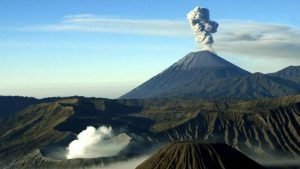 Mount Bromo Semeru Trekking Tour its famous trip East Java active volcano of the Bromo and Semeru. This trip starts from Surabaya Airport,Hotel or Train Station and ends at the same airport or Hotel. The trekking trip take 4 days fully organised private tour. Mount Semeru also the bighest volcano in java 2676mdpl, is one of Indonesia’s most active volcanoes. What stands out most about this mountain is the fact that it erupts periodically (and very reliably so). Every 20 min or so, the volcano belches out a huge cloud of steam and smoke, sometimes interspersed with ash and stones. Upon arrival at Surabaya Airport, Hotel or Train Station our representatif will welcoming great and meets you then drive you to Ranu Pane Lumajang district about 4-5h. Check in at your accommodation and free program. After Breakfas we will begin our hard trip to start our trekking journey. We will trek up to Ranu Kumbolo about 10km, as you will ascend the trek trail you will enjoy awesome scenery from Ranu Kumbolo, ( we will have lunch ) than the continue to camp site at Kali Mati about 6km and stay over night by tent. At 5pm we will have early dinner and rest. Wake up call about 00 am then having a light breakfast and a cup of tea then trek up to attac the mount semeru summit, enjoy the the sorounding and Sunrise. Back to Kali Mati for having breakfast and start packing proceed to return to Ranu Pani Village stop ranu kumbolo again for rest 1h. By 4x4wd Jeep, we drive you on to Cemoro Lawang Village crossing the Bromo’s Sea of Sand area for your overnight stay at the closest situated hotel to the Caldera check in hotel and free program. Another early morning wake up and start driving by jeep to Mount Pananjakan (2,770 M asl) for a spectacular view of sunrise over Mt. Bromo, Mt. Batok and Mt Semeru. From Pananjakan1 after that we crossing down to mount bromo to see the crater and beautifull panorama sand of sea from bromo crater, after finish for your take picture and enjoying on the top we will go back to hotel for having breakfast in the hotel. After that by air-conditioned car we drive you in about 3,5 hours journey to Surabaya airport for your flight to your next destination or droping in surabaya hotel program Mount Bromo Semeru Trekking Tour 4D3N is ended.